Many of you will know a lovely quilter called Salley who always leaves the most wonderful comments on my blog (and others). Salley doesn't yet have a blog (I'm working on it!) so she doesn't have any followers she can ask for a small favour and I thought I'd ask on her behalf! 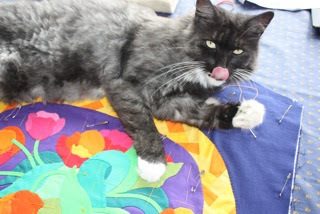 Jackie at Canton Village Quilt Works is running a pets on quilts competition on Facebook and it would be lovely if those of you who have a Facebook account would go and vote for Salley's cat, Polo. Salley told me that she employs Polo to do her basting but I think it's more that Polo deigns to help. After all, we all know you can't make cats do anything they don't want to! The links for the competition are here and here. 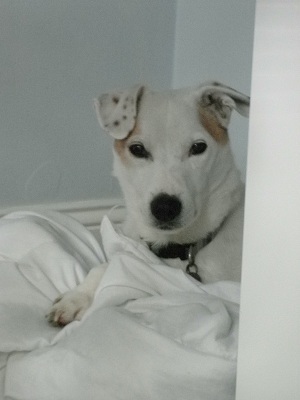 I'm not sure which link is the best to use (but I think it's the first - please be patient as I imagine the photos may take a while to load) as I don't have a Facebook account...all you have to do is 'like' the photo of Polo, if indeed she's your favourite. (Subtle hint: she'd better be!) Thank you! Archie is feeling much brighter and really appreciates all your kind comments about him. Am I getting that biscuit or what?! See? Much more like his usual self! Sorry about the 'boy' bit on show...I tried using Picmonkey to, ahem, find a disguise but everything I did just highlighted matters instead! I don't think there's anything wrong with the photo but perhaps I'm biased! 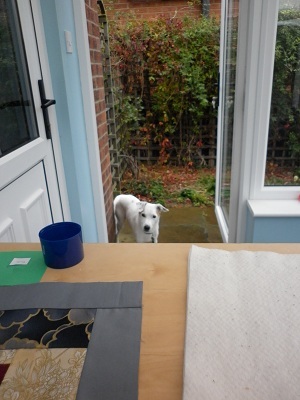 The vet's best guess was that the cold, damp weather has made his creaky knees painful. She said they're not the worst she's ever felt in a dog his age (he'll be thirteen in February-ish. 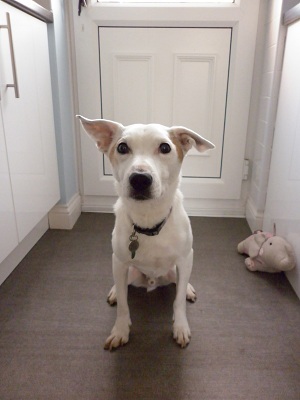 It's hard to know the month for definite as he's a rescue dog but as he was in the same rescue centre as a puppy it's as accurate an age as you're going to get for a rescue dog!) but just because they don't feel horrific doesn't mean they're not painful. 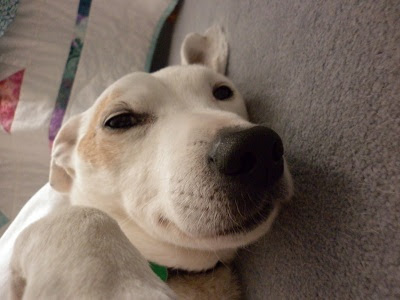 He's on Tramadol (again!) for ten days and she said if that didn't perk him up then he'd need a blood test to check on his liver. Fortunately, he's already feeling much perkier and, although he's on a long lead for the next week or so, he's thoroughly enjoying his walks and he's going up and down stairs as normal, which he wasn't doing on Tuesday/Wednesday. 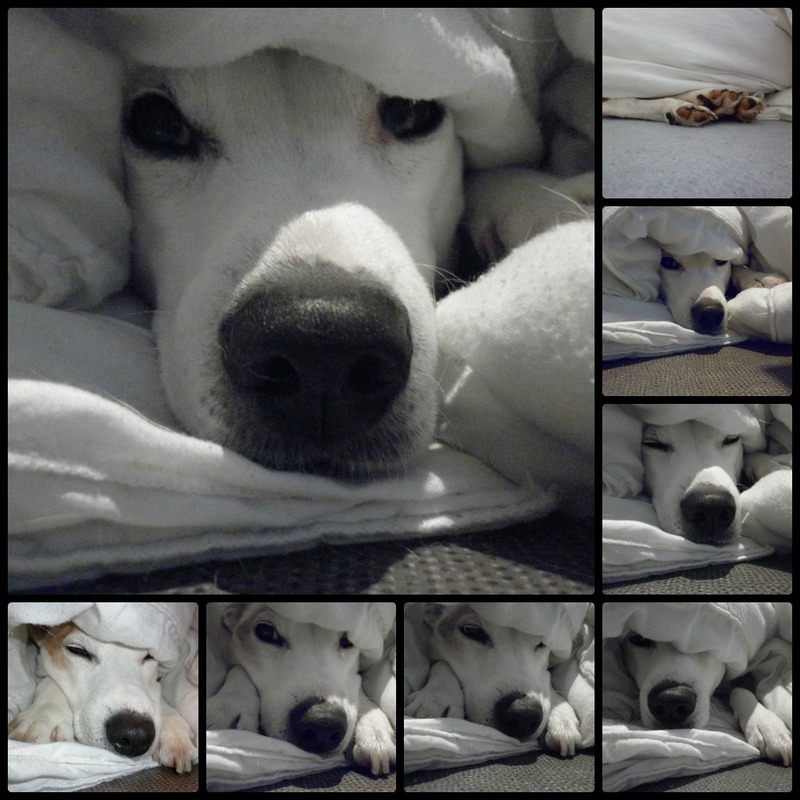 Just to make sure the canine/feline balance is back to normal here is a collection of photos of Archie in under his bed, taken a couple of weeks ago. Please don't forget to vote for Polo - thank you!! P.S. I'm sorry I haven't replied to all your lovely comments from my last post - I will reply, promise! Firstly, though, I want to apologise for all the photos - it's not going to get light today (it's tanking down) so they're not the brightest photos in the world! 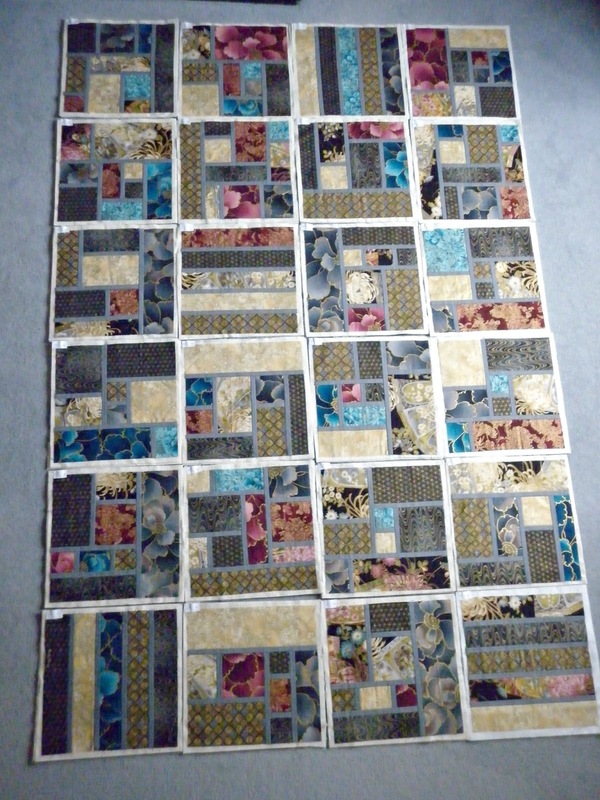 I've quilted sixteen of the Stained QAL blocks. I went with the wavy lines in the end and I'm really pleased with the texture of the blocks. The heavy quilting (perhaps combined with a double layer of wadding) has pulled the blocks in so they're going to be 11.5" finished rather than the planned 12" but that's not a problem, it ends up measuring what it ends up measuring. I'm trying to do a couple of blocks a day. Sometimes I manage more, more often I manage none but I've only got eight left to quilt so I hope to be trimming them next week. 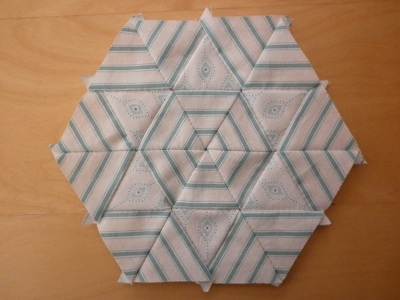 The main thing I've been working on is my hexagon quilt. 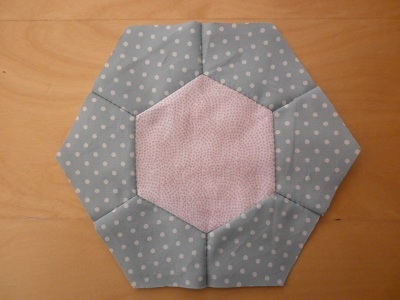 I finally sat down and worked out how many partial and half hexagons I would need to complete the quilt and in doing so discovered that I preferred the first and final rows to start with a half hexagon (otherwise known as a trapezium!) 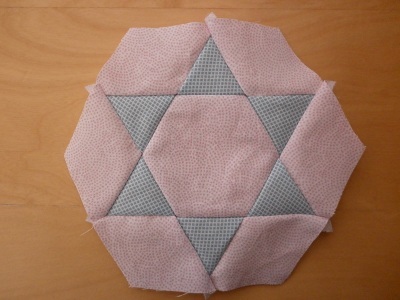 so I need fewer hexagons than I thought. I was working towards 202 and now I only need 195 and I'm almost there! I've got nine left to piece and they're in my tin, waiting patiently for their turn. 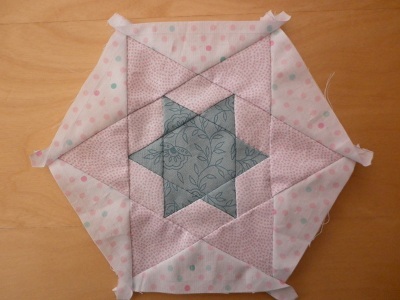 I love these star in a star hexagons. This is much more interesting in real life - the colours are washed out here! The stripes were a s*d to match (it's that fabric!) but it was worth it! 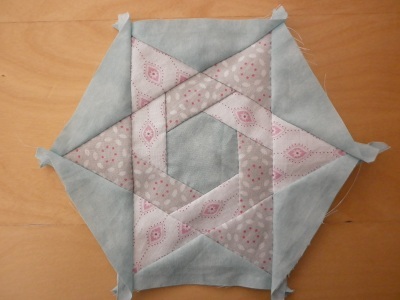 Another star in a star - I love that grey triangle fabric! Another simple one - if they were all fancy they'd end up fighting for attention! Very simple and in need of a press! 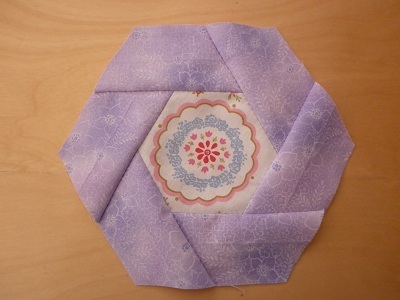 I hadn't realised how much I'd missed hand piecing over the last couple of months until I sat down and started again. 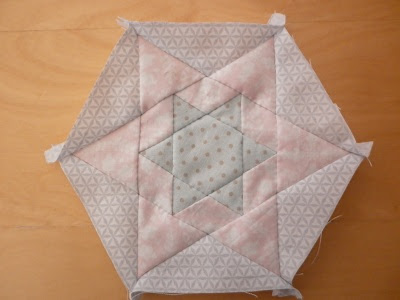 It's taken a long time for me to feel up to preparing any of the hexagons but I'm so glad I'm now able to get back to them. I've cut out all the whole (i.e. unpieced) hexagons that I need to scatter round the centre of the quilt top (seventeen in all) and once I've pieced the remaining hexies I'm going to sort out the pieces that will square up the edges. 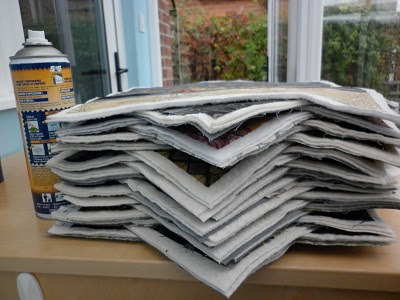 I'm hoping I've used enough different prints in the pieced hexagons to be able to have one of every print as either a whole, half or partial hexagon (a triangle!) and no repeats. I'm not sure that makes sense! 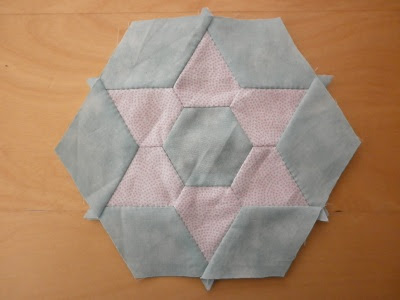 What I mean is that I don't want any two hexagons (whole, pieced or otherwise) to be the same. Fingers crossed I manage it! Here's a photo of the man dog himself, feeling a little sorry for himself. Although I'd also just woken him up so that won't have helped! Do you mind? I was asleep! I'm linking up with WIP Wednesday with Lee@Freshly Pieced (something I don't manage all that often but then I don't manage blogging very often so that shouldn't come as a surprise!) - why not pop over and see what other people are up to? Or link up yourself? I hope you're having a lovely week and that your stitching is going well! P.S. I've been lucky enough to receive some lovely post in the last couple of weeks - I'll show you next time! And then sorted out the blocks and stuck them to the wadding. 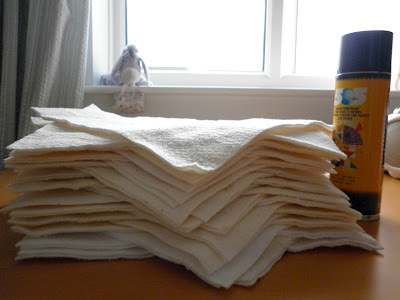 I learnt my lesson about the after-effects of spray basting (tight chest and very sore, itchy hands) and, instead of spraying them in my sewing room in front of a wide-open window, I decamped to the conservatory... I briefly considered donning gloves but decided that would be a step too far - I just washed my hands at regular intervals and then three times when I'd finished! ...where I could stand in front of the open door. I just brought through one set of squares at a time so I could get out of the room every few minutes and allow the fumes/smell to dissipate and keeping the door through to the house closed meant the smell didn't spread. Much better! A squishy pile of quilt blocks (in case you're wondering about the scale - that's a 500ml can of spray). It's still not great but it gives you some idea. 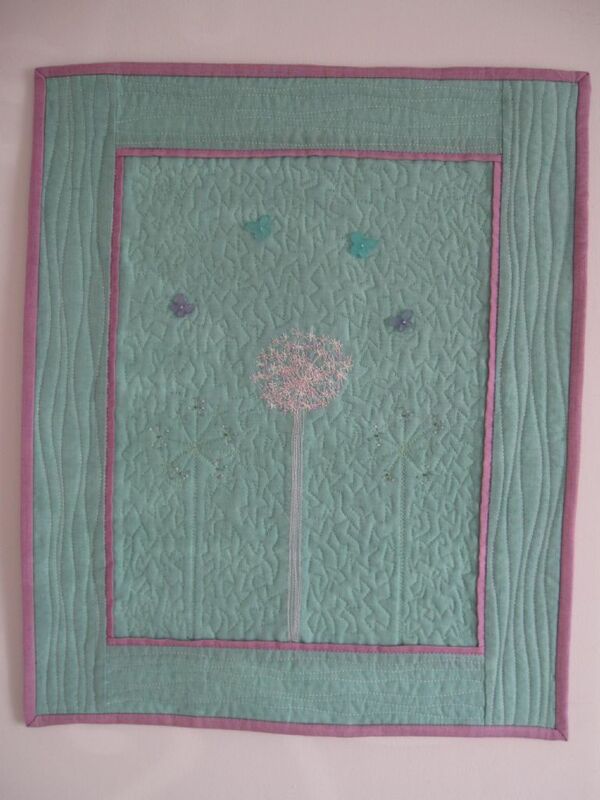 This quilt is for my mam (and therefore not my usual style/colours of fabrics - I do like them, just not for me!) and I'm using the bits left over from this quilt. 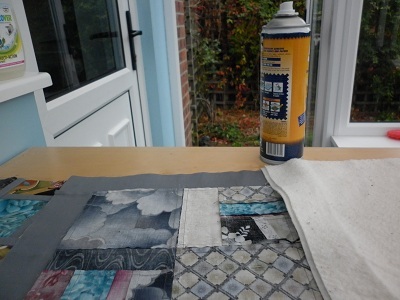 I decided that the design of the quilt would be ideal for QAYG, particularly as I'm using a double layer of wadding to make it nice and warm (and heavy!) and don't fancy wrestling the whole quilt through the machine. So, here's where I need your opinions! Please imagine grey sashing strips between the blocks! Again, imagine the blocks have grey sashing strips between them! 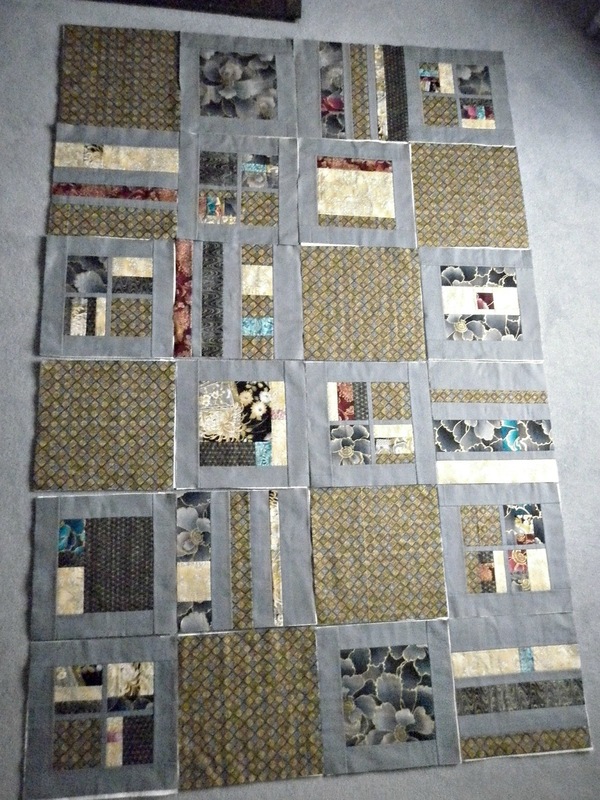 How should I quilt it?!! Sorry, it's a rubbish photo - I think it may have been taken on my mobile! 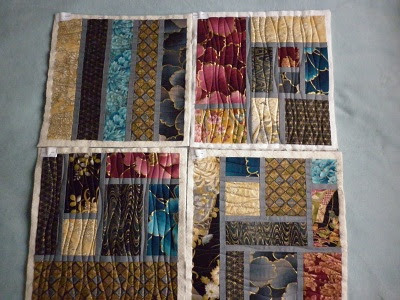 I thought I'd alternate the direction of the lines so that the quilting on each block went in a different direction to its neighbours. 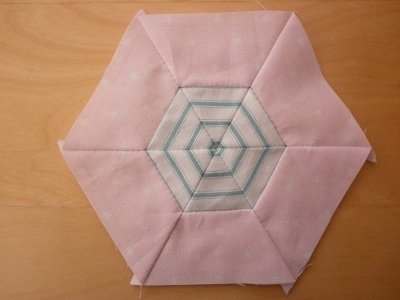 My second plan (in case quilting through two layers of 'Warm and Natural' wadding is awful!) 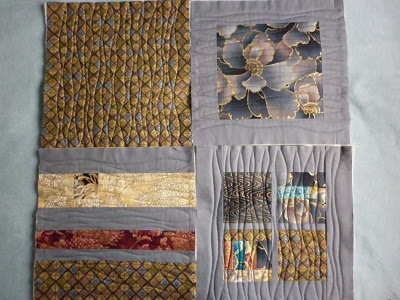 is to stitch one or two sets of diagonal lines across each (12") block. Do these plans sound like they'd suit the quilt? Have you got any other suggestions?! 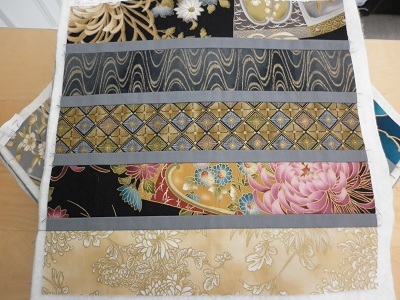 As the 'between the blocks' sashing isn't going to be quilted I don't want something where the quilting lines are going to have to line up from one block to the next. 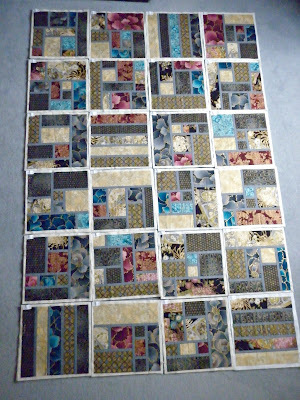 And I really don't think I can face quilting in the ditch around all those pieces, even though I would just be doing a block at a time...oh, and I don't do FMQ, even though it could be the perfect solution for this quilt. I've tried (on the allium wall hanging) and found it just too tiring (and stressful). Other than that all, suggestions are welcome - please chip in! 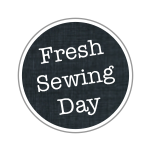 I haven't really done much this month but I thought I'd link up to Fresh Sewing Day and make a mosaic to show just how little I've done! 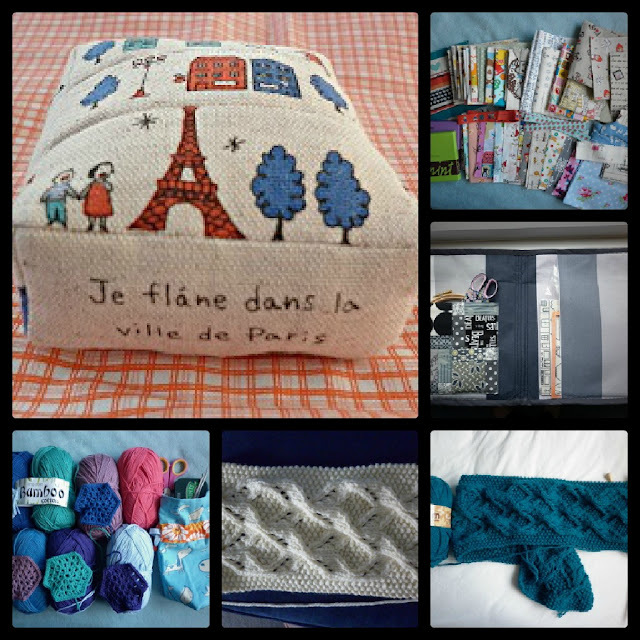 Clockwise from top left: an EPP Paris pin cushion, some gorgeous Japanese import fabrics from Sarah, the start (finally!) of my Summersville quilt (I've almost finished the first square), my first Umaro scarf (completed), my second Umaro scarf (halfway through), my invisible crochet blanket. What are you up to? Does it involve food? You're in and out like a yo-yo and I'm getting dizzy. And hungry. P.S. If you fancy a laugh at my expense...it was only when naming and saving my 'October' mosaic I realised that for the entire month of October I've been tagging my photos (and saving them in the folder marked) September 2012. I hadn't even made a folder for October...I knew it was October,I just had linked that fact with the photo tag/folder name...I'm such a divvy!